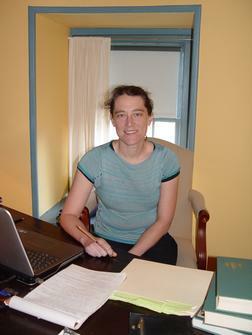 Emily is an Environmental Historian and Historian of Ecology. Emily spent her time at Grey Towers finishing her book manuscript, Money Trees: The Douglas Fir and American Forestry, 1900-1949. This book explores the history of American forestry from the beginning of the 20th century to the 1940s. She works at the Max Planck Institute for the History of Science in Berlin. Emily K. Brock, Money Trees: The Douglas Fir and American Forestry, 1900-1949. Oregon State University Press, 2015. Emily K. Brock, “The Desert and the Dendrograph: Place, Community, and Ecological Instrumentation” in Alfred Nordmann and Nicola Mößner, editors, Reasoning in Measurement. Pickering & Chatto, London (forthcoming, 2015). Emily K. Brock, “Repairing the Damage: Reforestation and the Origins of the Modern Industrial Tree Farm” in H. Thomas Foster, II, Lisa M. Paciulli, and David J. Goldstein, Viewing the Future in the Past: Historical Ecology Applications to Environmental Issues, University of South Carolina Press (forthcoming, 2015). Emily K. Brock, “New Patterns in Old Places: Forest History for the Global Present” in Andrew Isenberg, editor, The Oxford Handbook of Environmental History. Oxford University Press, 2014.